Add this Simple 5-Minute Cheesy Hamburger and Potatoes recipe to the growing list of reasons it is awesome to have a stash of frozen hashbrowns waiting in the freezer! Around here, we like our recipes to be both easy to prepare and made with real food. Why? Because loving God and loving people is more important than well, anything else in this world. Therefore, we’re learning to do everything possible to keep our food as nourishing as possible, all while preparing it as quickly as possible. This frees up our time and energy to spend doing what God calls us to do each day. Frozen Hashbrowns for the win! 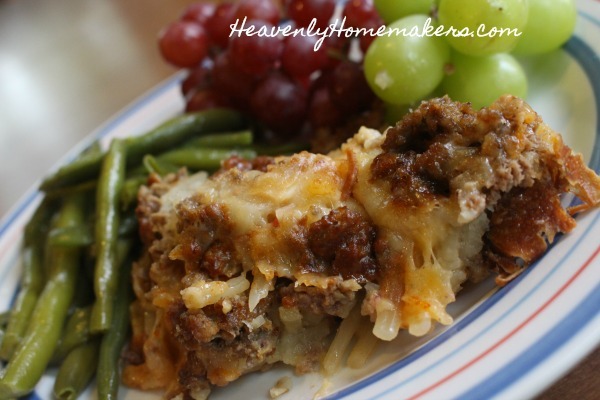 Since discovering these, I’ve come up with a variety of fun Hashbrown Casseroles that my family loves and that take only a few minutes to put together. Many can be made either in the oven or in the crock pot, which means I can make adjustments based on what we have going on each day! Today we’re adding 5-Minute Cheesy Potatoes and Beef to the list! How can this be made in 5 minutes? Well, with our trusty frozen hashbrowns of course. And also, IF you follow this handy trick of cooking hamburger meat ahead of time, then all you have to do is pull out cooked meat, add it to your crock pot or baking dish with the other ingredients, and in 5 minutes, dinner is ready to bake! Brown hamburger meat in a skillet on the stove-top. 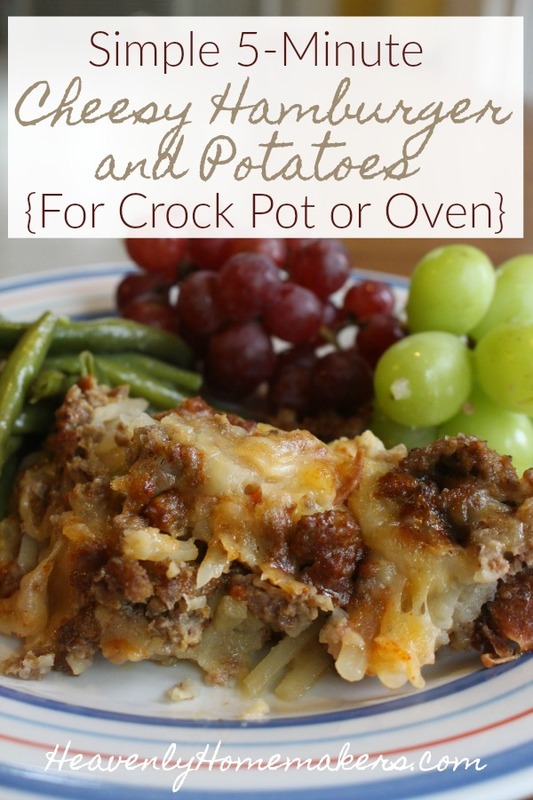 In a large crock pot, layer ½ of the potatoes followed by ½ of the cooked meat. Sprinkle with 1 Tablespoon minced onion, ½ teaspoon paprika, ½ teaspoon garlic powder, ½ teaspoon sea salt, and 1½ cups shredded cheese. Repeat with another layer of potatoes, meat, seasonings, and cheese. Drizzle broth over the ingredients and put the lid on the crock pot. Cook on "Hi" for 4 hours. Need some veggies to go with this meal. YES. Always. :) Here are my favorite easy ways to prepare veggies to go with our meals! Laura I make something similar to this that’s good too, and super simple. I brown a pound or two of hamburger meat with minced onions and then put in casserole dish followed by a 2 lb bag of tator tots, then 8 oz cheddar cheese, and pour two cups of heavy cream evenly over top. Bake at 350 for 30 minutes uncovered then covered for another 30 minutes. I call it tator tot casserole and it’s delicious ( kind of reminds me of loaded fries) for a meal to take to new mom etc… Yours looks great too by the way! Hope you’re doing well. Thanks as always for the simple and healthy recipes, so we can spend more time loving and serving our families :). Laura, how long should your recipe bake for? I didn’t get the ingredients until this evening, so crock pot tonight is out! Thanks!! I’d go with an hour at 350! And do we cover it? (I didn’t get it into the crockpot on time, either!) and just in a casserole? Thank you, Laura! I think I’d go uncovered for this!